Yesterday I went over to the new city hall to see the unveiling of a new sculpture by artist Ron Baird called Oshawa Rising. It's pretty and reflective and the artist is such a charming, jovial fellow that you can't help but be thrilled he won the contest I mention in my article this month. The Lakeridge Health mobile was designed by Ron Baird, whose work will also be featured at City Hall. Evidence of various metals being used to create sculptural forms dates back thousands of years. The art form evolved from a functional artisan trade used to cast weapons and coins to the decorative arts over time. The oldest decorative item in existence (a cast copper frog) dates to 3200 BC, but evidence of the Egyptians using cast metal for sculpture dates back at least 300 years before that. Many of the best decorative examples were likely destroyed during times of war when the metals were melted down to create weapons. In modern times, metal sculpture has become familiar as a defining element of urban landscapes and interiors. The exhibition explores space and the relation an object has to its surroundings. A sculpture alters the feeling you have when entering a space. Walking through MetaLogic one senses their place within the space of the gallery in a different way than possible when looking at two-dimensional works on the wall. This is something you may have experienced in the atrium of the gallery, where one of the best-known works in the RMG collection is on permanent display. 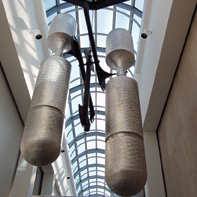 The ‘Silent Bells’ hang in the upper atrium space and rotate at a slow, methodical speed, creating a space that is fluid, full of movement and reflected light. Mesmerizing and monumental, the Silent Bells define the space they are displayed in dramatic fashion. The Bells were donated to the gallery by artist Ron Baird, who recently won the Oshawa City Hall art commission with his sculpture Oshawa Rising. Visitors will see themselves reflected in the polished stars of the sculpture, which in turn reflect each other and the movement and colours of the day. The work symbolizes a growing city built on a solid historical foundation, while reflecting light onto walls, ceilings and stairs. The five metre high work is designed to define a space that Oshawa residents will come to know well. A graduate of the Ontario College of Art and member of the Royal Canadian Academy, Baird has completed more than 150 public commissions and installations of his dynamic metal works. Among those is his breathtaking mobile, found at the Lakeridge Health Oshawa Hospital entrance. The mobile shimmers through the air like a flock of birds or is perhaps reminiscent of a sun-spotted lake surface, suited to the namesake of the hospital. Whatever the interpretation of sculptural works, they animate the space surrounding them simply with their presence. The City Hall sculpture is to be unveiled in a ceremony at hosted by Greg Murphy, dean of the School of Media, Art and Design at Durham College, on Tuesday, April 12 at 1 p.m.